Acne is a multi factorial, chronic skin condition. This means it is a skin condition caused by a variety of factors and is usually known to be long lasting. Acne can definitely be effectively managed when we understand the pathology of it. The first stage involves a blocked pore. Our skin has little openings called pores, through which the skin “empties” itself of sweat, oils. Pores can be blocked when we don’t clean our skin effectively after a long day. Pores may be blocked also by dead cells sitting on the surface of our skin. We know that patients with oilier skin types are more likely to have thicker oil on the surface of their skin which contributes to the dead cells adhering tighter to the skin’s surface and blocking our pores. When a pore is blocked, sebum (oil), sweat and normal skin bacteria become trapped beneath the skins surface. These cause skin irritation and begin a cascade of what we call “inflammation” beneath the skin’s surface. As the pore becomes blocked, it becomes dilated with this excess junk, and basically what we know to be a “pimple” is formed. A range of factors may make one person more likely to have blocked pores than another. These include lifestyle factors, hormonal changes (menstruation, pregnancy, contraceptive pills and devices), diet, stress, certain medication, some medical conditions, cosmetic products being used, among others. Because of the multi causative nature of Acne, a consultation is always recommended to determine the cause of yours before treatment is commenced. There is a spectrum of available prescription treatments for acne ranging from topical products, antibiotics to oral medication. Again, treatment is individualized and tailored to suit the need of each acne patient. In treating acne, I would advise a consultation with a medical professional or skin doctor. I typically start with topical prescription cosmetic products and lifestyle modification if any alarming routines noticed. Because of the chronic nature of acne, patience and commitment to prescribed routine is necessary for achievement and maintenance of good results. For resistant acne, I may prescribe oral anti androgens (medication that will reduce the effect of acne causing hormones in your body). In few instances, where other clinical signs are evident, you may be referred for further blood investigation to rule out hormonal or gynecological issues. 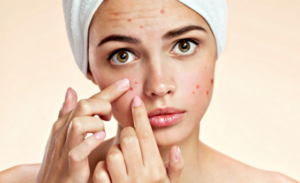 It is best to treat acne earlier rather than later as poorly managed acne may lead to what we call post inflammatory hyperpigmentation (black spots) on the skin, and other acne scarring.